She is urging voters to elect Liberals to prevent an NDP or PC majority government. Ontario Liberal Party Leader Kathleen Wynne listen to students at the University of Waterloo during a campaign stop in Waterloo, Ont., on Friday, June 1, 2018. TORONTO — An emotional Kathleen Wynne admitted Saturday that her party will lose the Ontario election next week but urged voters to elect as many Liberals to prevent either of her rivals from forming a majority government. 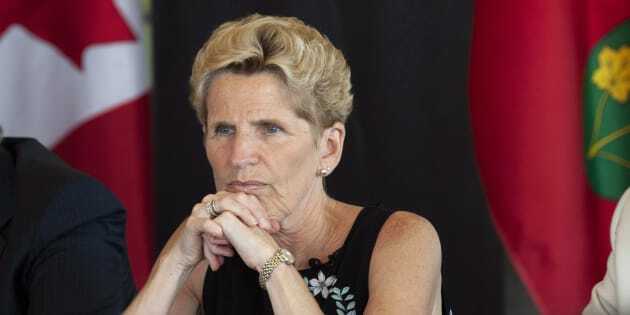 Her voice breaking up at times, Wynne appealed to voters to set aside their feelings about her and support Liberal candidates in order to keep the next government in check. Her plea comes at a time where polls suggest the governing Liberals, who have been trailing behind the Progressive Conservatives and the New Democrats, could be at risk of losing official party status after the June 7 vote. "If your concern is that you'd be electing me or electing a Liberal government, that's not going to happen," she said. "And so we need Liberals at Queen's Park to stop a majority for either of the other governments." The premier wouldn't say whether she'll stay on as party leader after the election, and declined to endorse either the Tories or the NDP. Nor would she comment on the possibility of strategic voting, a perennial issue in elections where voters appear to be clamouring for change. Wynne said whichever way the vote goes, people should hope for a minority win to keep the government "from acting too extreme — one way or the other." NDP leader Andrea Horwath is urging people not to vote for the Liberals, saying it won't lead to a minority government, it will lead to a Progressive Conservative majority. Tory leader Doug Ford had little to say about the announcement, noting only that the election is about change and people are fed up. Asked if he was surprised by Wynne's decision, Ford says his team is focused and has been focused on getting its message out. Tamara Small, a political science professor at University of Guelph, said Wynne made a strategic — and "very unusual" — move in predicting her own government's defeat. "It's a realization that the Kathleen Wynne brand might be more detrimental than the Liberal party brand," she said. "They're hoping they can salvage (the party)... it's about saying to people: don't abandon us. We will fix this." By taking the blame, Wynne could be saving some of her key candidates who otherwise might have been tarnished by public opinion of her, Small said. "So I think electorally, it's strategic, but as a leader of a party, I actually think it's really selfless. She's saying, 'I'm not going to destroy this organization with my own personal hubris.'" We're in the homestretch of this election campaign and I just wanted to say a few words about what lies ahead and my perspective on the decision left to voters. On June 7th voters will elect a new government. I don't know who voters will choose but I am pretty sure that it won't be me. After Thursday, I will no longer be Ontario's Premier. And I'm okay with that. Because, as I've said many times before — it's not about me. It's about the people of this province. It's about their wellbeing. And their futures. It's about their jobs. Not my job. As Premier, I've tried to dedicate myself to fighting for those people. For the single mother struggling to raise a family while living on the minimum wage. For the student who's earned the grades to go to university — but whose family hasn't earned quite enough to cover tuition. For the dad in the 905 who has to drive for an hour stuck in traffic each day, both ways — for whom expanded GO train service makes all the difference. For the adult daughter who does all she can to care for her aging parents while she also scrambles to find safe, affordable child care for her own toddler. And for the countless other families working hard, contributing so much to our communities and counting on government to make their lives just a little bit easier, their load just a little bit lighter, their futures just a little bit brighter. People want change but, by and large, they are confident about where Ontario stands and where Ontario's headed. For this reason, many voters are worried about handing a blank cheque to either Doug Ford or the NDP. With a majority government Doug Ford would have too free a hand for the comfort of most people — they don't trust his judgment. They don't trust the choices he would make. This is a man who was only too happy to open up the Greenbelt to condo development until he was caught out. Who mused about selling cannabis in corner stores — where our kids shop. This is a man who has promised to cut $40 billion out of government services and pretends it can be done without costing a single job or harming our hospitals or our schools. This is a man who has defended candidates who speak ill of others — who smear people because of their religion or gender or sexual orientation. I don't believe this is a man that people want to hand Ontario over to without putting him on the shortest of short leashes. And the sentiment toward the NDP is much the same. People worry about what will happen to our economy if the NDP take power and form a majority government with nothing to hold them back. People worry that the NDP will raise taxes on small businesses, that they will take unemployment higher and job creation lower. They will permit strikes to carry on — like they have at York University — even after all hope of a negotiated settlement has been exhausted. People worry that the NDP will approach the responsibility of running Ontario's economy with a plan that is risky and unrealistic. So, it comes down to this — voters are going to pick a new premier but they are generally worried about giving that person — whether it's Doug Ford or the NDP — too much power. They're worried about giving them too much of a free hand because they're concerned about what that might mean for our economy and our future. And that's why a vote for the Liberal Party can mean so much. The more Liberal MPPs we send to Queen's Park on June 7th, the less likely it becomes that either Doug Ford or the NDP will be able to form a majority government. By voting Liberal you can keep the next government, Conservative or NDP, from acting too extreme — one way or the other. By voting Liberal you can keep the next government, Conservative or NDP, accountable to you. By voting Liberal you can keep Doug Ford — and the NDP, from having a blank cheque. So, with a few days left, my message is this: a vote for the Liberal Party is a vote to keep the next government in check. A vote for the Liberal Party is your best bet to make sure that the next government is not a majority government. And that the next government is held to account to all voters. So, for the next few days I will campaign hard to elect as many Liberals as possible. We will fight for our values — for a practical approach and for a government that will be kept from extremes and forced toward a better balance for the people of this province. We have a terrific team of local candidates, they deserve your support. They will fight for your votes. And I will fight for them.